But there is more to learning. 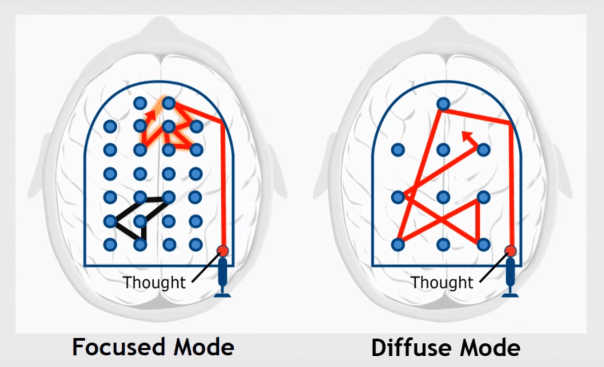 In here TED Talk “Learning how to learn” Barbara Oakley talks about two fundamental learning modes of our brain: focused mode and the more relaxed diffused mode. When your are learning, you want to go back and forth between these two modes. when you are stuck, you defocus going into the diffused mode, generating new ideas. If you want to learn more about this, I recommend the coursera MOOC “Learning How to Learn: Powerful mental tools to help you master tough subjects“. Two of the things I took from that course is that active listening (e.g. by asking questions) is far more effective. Also learning by doing is a great way to learn fast. Learning and thinking are closely related. While researching thinking and thinking skills, I stumbled upon a great TED talk by Dr. Derek Cabrera called ”How Thinking Works”. He talks the schooling system teaching about 4 universal thinking skills. Schools nowadays are over-engineering the content curriculum: students do not learn to think, they learn to memorize stuff. Kids are learned to follow instructions, like painting by the numbers. To fix this, we need to learn how to think better and for that he suggests four thinking skills: DSRP. A simple set of rules to become better in systems thinking. All talks at TestBash are recorded. As soon as I have the link to my talk, I will post it here.